Tensions in Venezuela are high as thousands of protestors took to the streets and opposition leader Juan Guaido declared himself interim president in an attempt to push aside President Nicolas Maduro. Venezuelans must enact political change "through peaceful and constitutional means and not through the barrel of a gun," says Canada's former ambassador to the country. 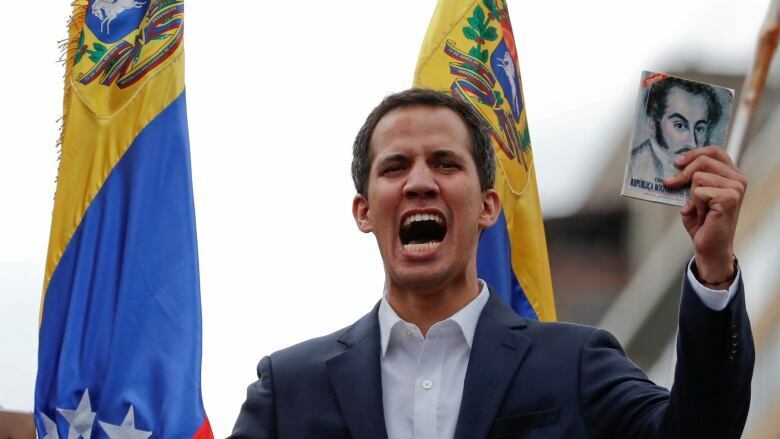 In front of the crowd in Caracas, Venezuelan opposition leader Juan Guaido — who heads the country's National Assembly — declared himself interim president on Wednesday, as hundreds of thousands marched to demand the end of socialist leader Nicolas Maduro's government. Canada and the U.S. have both recognized Guaido as acting president. The dramatic move follows two nights of sometimes violent protests in which four people have been killed, according to rights group Venezuelan Observatory of Social Conflict. Ben Rowswell was Canada's ambassador to Venezuela until July 2017, when the last wave of major protests took place in the country. Here is part of his conversation with As It Happens host Carol Off. So what exactly is this gesture? It's not a coup. What is Guaido basing his legitimacy in declaring himself the president? Since the president's term expired Jan. 10 without a legitimate presidential election, the last time that the people of Venezuelan voted in a free and fair election for an authority of any kind was the legislative assembly in 2015. And so that mandate is still very much active and, therefore, there's a popular mandate for that legislature. What's happened is the head of that legislature has now said I'm not only going to leave that legislature, but I'm going to leave the executive branch of the government. And Canada has recognized that because there needs to be at least some kind of popular mandate behind the person at the head of the government for the very difficult work that needs to be done to restore stability and bring Venezuela back to democracy. But who is Juan Guaido? He seems to be very young, relatively unknown. How did he come to be leading this movement? He has emerged as a candidate that could unify all of the factions of the opposition. So Guaido, with his charisma, has been to bring together these various groups that all are united in there desire to restore the popular sovereignty of Venezuela. And the moment was just right for there to be some kind of outpouring of support for a single person who might come forward. When you were the ambassador there, Canada and you made numerous statements against the human rights abuses that you were witnessing at the hands of the Maduro government. 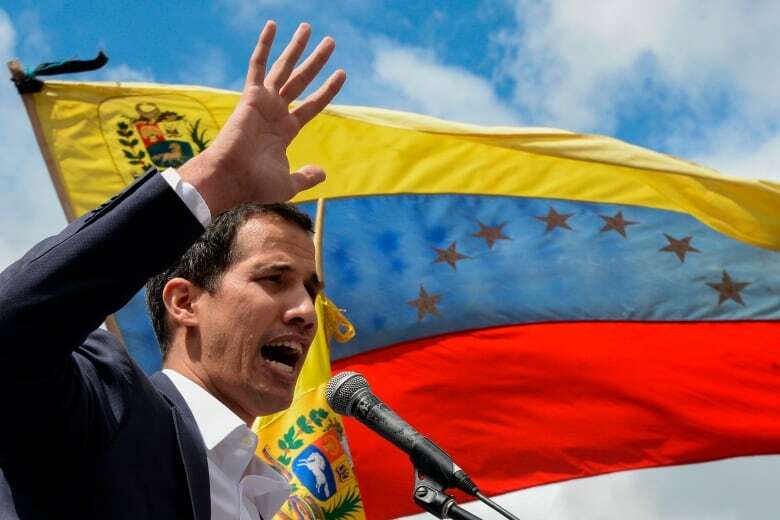 Today, a very interesting twist, Global Affairs Canada says Canada will recognize Juan Guaido as the interim president of Venezuela, which puts us in an unusual place of being sort of foreign policy lockstep with Donald Trump, which doesn't happen very often. Are we on the right side of history to make that decision? I think that the United States needs to be treated separately. The way to look at this is that Maduro has taken away the popular sovereignty of the people of Venezuela. They have the right to choose their own government. He has denied them that right. And so, Canada's position is that popular sovereignty must be restored. This is why Canada has recognized the head of the National Assembly, the legislature, as the interim president. The United States has gone one step further and has said that they would be prepared to use all means necessary to support a transition. I think that is wildly irresponsible and it is fundamentally undemocratic because if we're interested in the right of the Venezuelans to choose their on government, having some foreign military force take that decision for them actually is the opposite of popular sovereignty. If you could urge Donald Trump, the White House, to do anything, what would you say to them? Just be quiet, and let the Venezuelans speak for themselves. 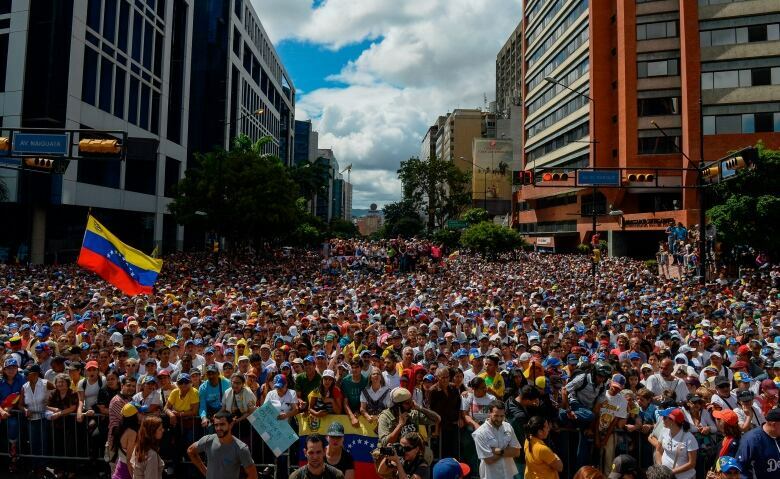 The Venezuelans are speaking for themselves by coming to the streets by the hundreds of thousands. They are showing that the government of Nicolas Maduro does not have support. They are showing that they want a change. But it's a change that they need to make themselves. How volatile is the situation right now in Venezuela? I would say it's highly volatile and we should be appealing for calm. This is a country that's gone through serious economic depravation, serious hungry, and increasingly, serious repression. So there's a lot of anger and potential for violence. And, of course, once violence sets in, no matter who is responsible for it, it starts to harden positions and makes it much more difficult for there to be a transition to any kind of democratic system afterwards. Given that Mr. Maduro is unlikely to back down — if he remains, if he refuses to recognize this shift, what then happens? The hope is that the armed forces of Venezuela, which have throughout the history of Venezuela shown a remarkable knack for self-preservation ... we'll see which way the wind is shifting. What's unknown is who they would shift loyalties to. It's a very high-risk game and we should be insisting that there remain a civilian control of the military and that any political change that happens in Venezuela happens through peaceful and constitutional means and not through the barrel of a gun. Written by Kate Swoger and John McGill. Interview produced by Kate Swoger​. Q&A has been edited for length and clarity.